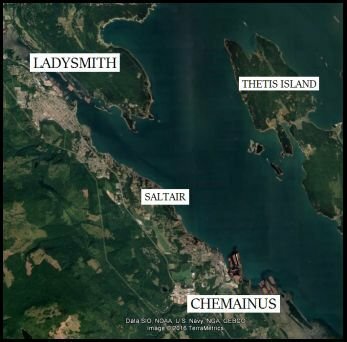 This charming seaside community is 13 minutes south of Ladysmith and 33 minutes south of Nanaimo. Amazing character homes are available in immaculate condition, with mature gardens and some ocean views. Many of these older homes are within the downtown core, just a few blocks from celebrated boutique shopping and the Chemainus Theatre. This is a very quiet corner of the Mid-Island - well worth the 30-min commute to a job in Nanaimo. I suspect that Chemainus will see a lot of growth in the next decade or two - there is a lot of space especially south of town (though that land is technically within the Cowichan Regional District). European settlers were here by the 1860s, and logging was the center of this area's economy for many decades. When that industry dwindled in the later 20th century, Chemainus played to its strengths, re-imagining itself as a mellow, artsy village by the sea. Now, tourists and people from all over the Island come here to admire the very walkable downtown core, its highly-rated performance theater productions, and (most famously) the gorgeous murals painted on the buildings. See Chemainus homes for sale below - or contact me if you'd like to view the homes in person!